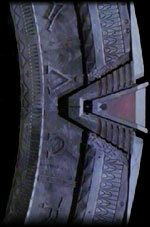 The Stargate is a piece of alien technology that has the ability to transport people across galaxies to other planets. The 'gates were used to transport humans from Earth to other planets as slaves and hosts for a parasitic race known as the Goa'uld. The humans of Earth rebelled against the Goa'uld and buried their 'gate, which was later discovered in the early 1900s in Egypt. A classified section of the United States Air Force, Stargate Command (the SGC), now controls the Stargate and sends military teams through it to: (1) procure alien technology that can help Earth defend itself against enemies (primarily the Goa'uld) and to (2) learn more about alien cultures.